CHICAGO -- Northern Trust today announced a reduction in the maximum annual management fee on certain FlexShares® Exchange Traded Funds, reflecting a continued strategy that focuses on serving the needs of investors and their advisors. FlexShares’ innovative lineup is designed to provide targeted investment outcomes and risk-adjusted returns with funds that address the four fundamental investor objectives of growing assets, managing risks, generating income and providing liquidity. Twenty-three of the 24 FlexShares ETFs focus on alternatively- or factor-weighted index strategies, with an emphasis on providing investment insights and thought leadership. This combination works together to enhance the overall value provided to investors. ETFs are among the fastest growing product categories in the U.S. asset management industry with 68 new sponsors entering the market over the last 5 years. In 2016, according to Morningstar, growth in the U.S. market increased more than 18 percent from the prior year to $2.4 trillion in assets as of Aug. 31, 2016. In the midst of this rapid growth, FlexShares, has raised over $10.4 billion in assets since September 2011 to September 2016. FlexShares Exchange Traded Funds are designed to pursue specific investment goals across both passive and active strategies. FlexShares offers differentiated ETF strategies that improve and simplify the investment decision process for the long-term investor. FlexShares iBoxx 3-Year Target Duration TIPS Fund (TDTT) and the FlexShares iBoxx 5-Year Target Duration TIPS Index Fund (TDTF) may invest in derivative instruments. Changes in the value of the derivative may not correlate with the underlying asset, rate or index and the Funds could lose more than the principal amount invested. The Funds are subject to fluctuation of yield risk, income risk, inflation protected security risk and interest rate/maturity risk. The Funds are non-diversified meaning the Funds’ performance may depend on the performance of a small number of issuers because the Funds may invest a large percentage of its assets in securities issued by or representing a small number of issuers. Duration is a measure of the sensitivity of a fixed income security’s price (or principal value) to a change in interest rates. Duration is expressed as a number of years and allows bonds of different maturities and coupon rates to be directly compared. The higher the duration, the greater the magnitude of price change as interest rates change. Modified adjusted duration (MAD) is an estimate of the market duration of a specific TIPS investment. MAD provides a way for investors to compare the interest rate sensitivity of TIPS to other fixed income securities, based on inflation expectations. 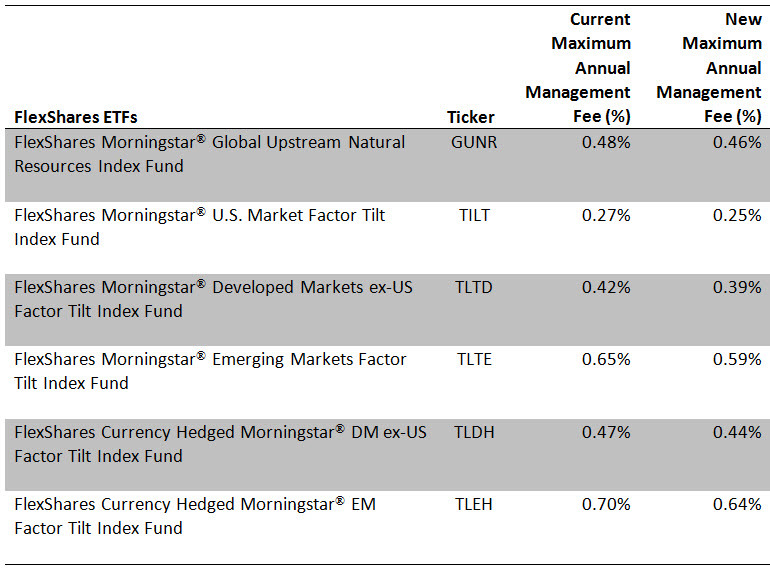 FlexShares Morningstar U.S. Market Factor Tilt Index Fund (TILT) is subject to concentration risk. The Fund's investments are concentrated in the securities of issuers in a particular market, industry, sector or asset class. The Fund may be subject to increased price volatility and may be more susceptible to adverse economic, market, political or regulatory occurrences affecting that market, industry, and sector or asset class. The Fund may also invest in derivative instruments. Changes in the value of the derivative may not correlate with the underlying asset, rate or index and the Fund could lose more than the principal amount invested. FlexShares Morningstar Global Upstream Natural Resources Index Fund (GUNR) is subject to the global natural resource industry. As the demand for or prices of natural resources increase, the Fund's equity investment generally would be expected to also increase. Conversely, declines in demand for or prices of natural resources generally would be expected to cause declines in value of such equity securities. Such declines may occur quickly and without warning and may negatively impact your investment in the Fund.